Tattoos for Now also provides Face and Body Art at various events. We are experts in bodypainting and have the ability to bodypaint models for promotional events quickly and accurately on-site. Many of our clients have Bodypainted promotional models at their events to add an element of intrigue and fun. Many of the models are greeters, pose with guests or fundraise. Tattoos for Now is able to suggest tasteful bodypainting concepts for your event and is able to provide a drawing of the concept design in pdf format. 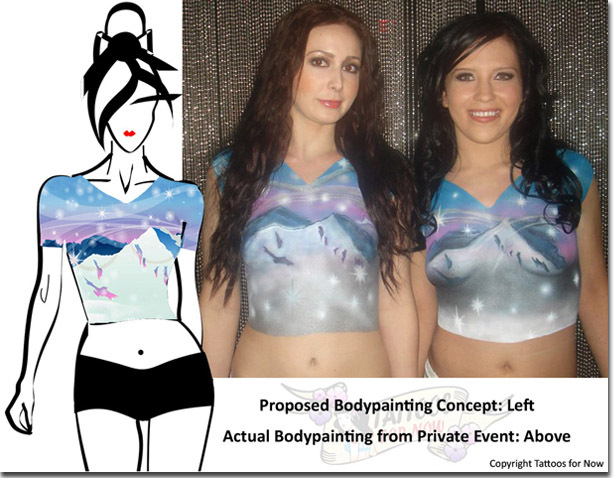 Our clients love the ability to pre-approve the design that will be blueprint for the bodypainting the day of their event.